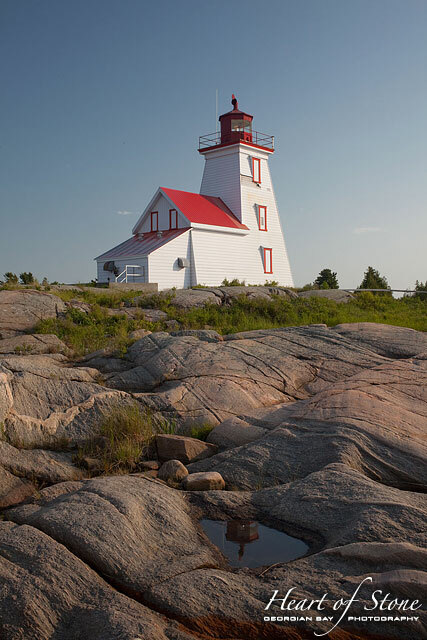 Heart of Stone is proud to announce the official launch of the Georgian Bay Lighthouse Survey (GBLS). 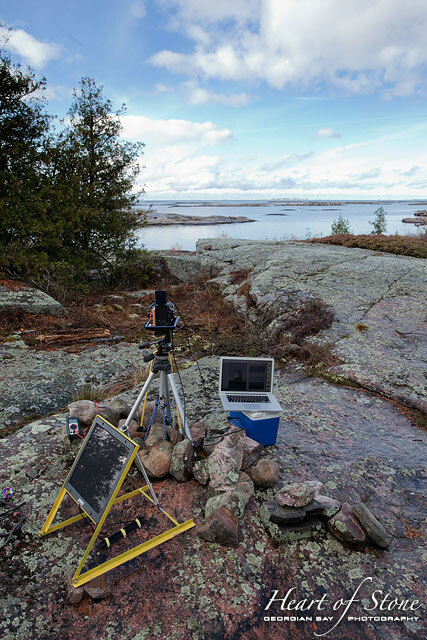 A multi-year project, the GBLS is using timelapse, photographic, and advanced remote camera technologies to document the lighthouses of Georgian Bay as never before. 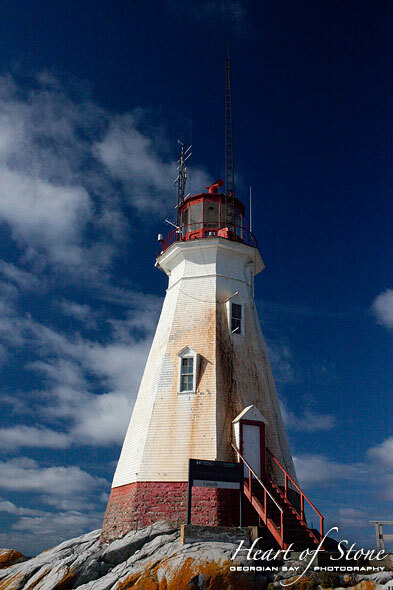 of Georgian Bay’s lighthouses (3.0MB MP4). 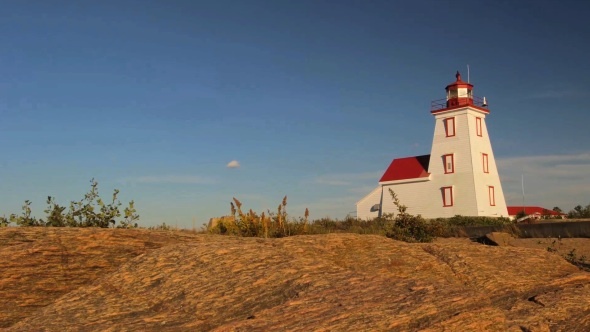 The days are numbered for many of Georgian Bay’s iconic lighthouses (click here to find out why). In a nutshell though, the government simply isn’t interested in maintaining them. 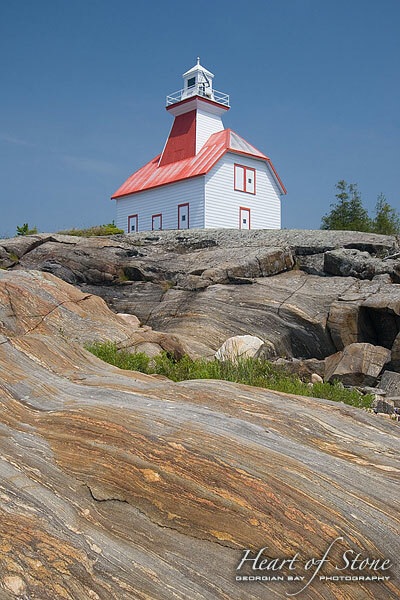 Lighthouses that aren’t granted Heritage Status by May 29, 2015 will very likely be torn down. Already some lighthouses, like the light on the Western Islands, are in dire need of repair, with major rot and broken windows. Losing these historical structures will be an incalculable loss to the heritage of Georgian Bay, and the GBLS is determined to preserve them as best we can. 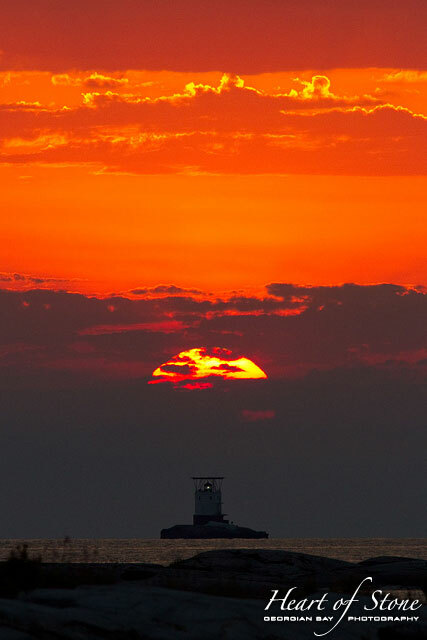 Above: the sun sets on the Bustard Rocks lighthouse and unique twin ranges, possibly for the last time. The original lightkeepers had many stories to tell. Late season storms would completely entomb the light at Red Rock in ice, trapping the keepers inside until help would arrive to chip them out. Life on the Bustard Rocks was about as remote as remote could possibly get. But without living there, it’s almost impossible to photograph major events properly. Enter remote camera technology. Using a unique combination of batteries, timers, solar panels, and environmental enclosures, GBLS cameras are out there on the rocks photographing Georgian Bay lights all winter long in the harshest of environments, producing otherwise impossible photographs. Eventually the GBLS will have a full suite of imagery of all Georgian Bay lights, in all seasons. But it isn’t easy. Above: twilight surrounds the lantern room and boathouse at Pointe au Baril. 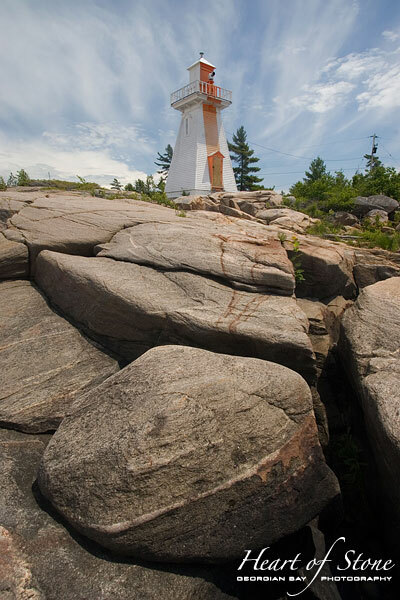 Much of Georgian Bay is wild, but sometimes the best view of a lighthouse is from private property. Jones Island, Snug Harbour, and Pointe au Baril are examples of cottage-dense areas. 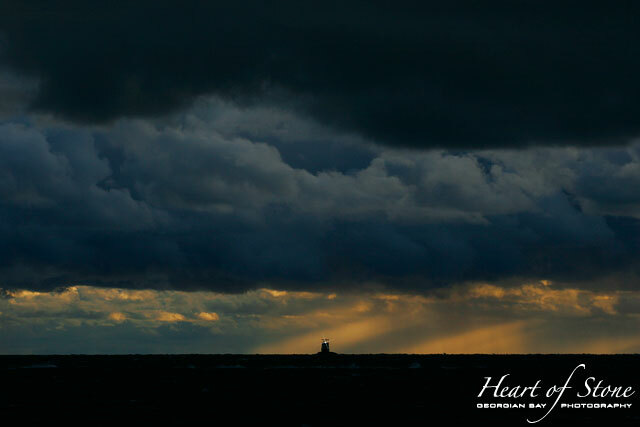 If you have a great view of a lighthouse, contact us: Heart of Stone and the GBLS will be in your area soon. 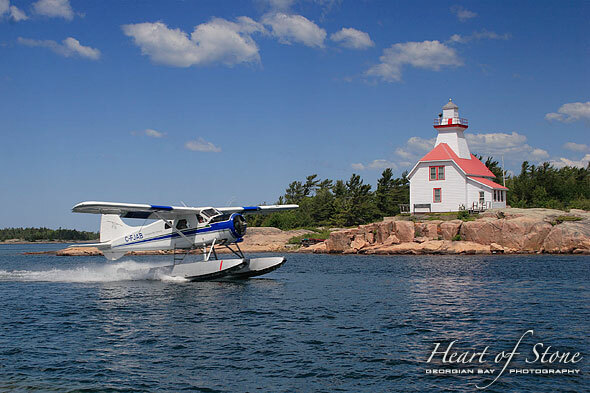 Above, left to right: sunset over the light at Red Rock, a de Havilland Beaver lands in front of the Snug Harbour lighthouse, and the lights on the Western Islands and Gereaux Island. 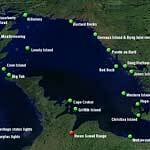 The Georgian Bay Lighthouse Survey is ongoing, and will continue to evolve over time. 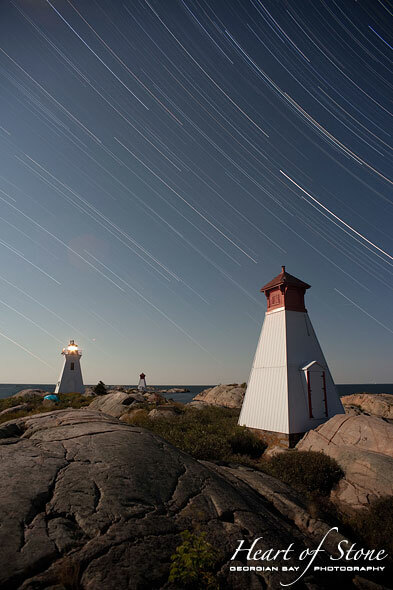 We’re already planning the 2014 season, with photographic expeditions to many Georgian Bay lights, including the Western Islands for a remote camera run over the 2014-15 winter. The types of media produced is evolving too, now incorporating specialized motion timelapse, lightning sensors, video, and high resolution panoramic imagery. There’s more than one way to photograph a lighthouse, or so they say. This is Georgian Bay, after all: you never know what you’ll find, but the GBLS will be there. For questions, comments, or for more information, please contact Sean Tamblyn. Above, left to right: the Byng Inlet front range, severe weather over the Red Rock, equatorial star trails over the Bustard Rocks, and flowing granite on Jones Island.